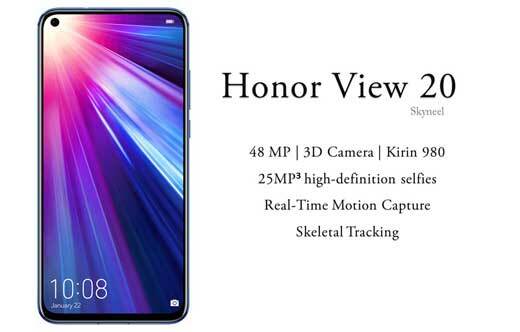 The Honor View 20 smartphone launched in the Global Market. This smartphone will be launched in Indian market on January 29 and sold exclusively on Amazon.in website. This smartphone has already been introduced for pre-order. Pre-ordering users are given Honor branded Bluetooth earphone free with this smartphone. The Honor View 20 smartphone is available at Amazon India from January 29. Honor View 20 smartphone already launched in China – December 2018. The phone comes with a 6.40-inch touchscreen display with a resolution of 1080 pixels by 2310 pixels. This smartphone is powered by octa-core processor and it comes with 6GB RAM and 128GB internal storage capacity. Honor View20 has been introduced in Europe in two storage variants with three color options. The first variant comes with 6GB RAM and 128GB storage capacity, which costs € 569 (approx Rs 46,000) or £ 499. The second variant comes with 8GB RAM and 256GB storage capacity which is priced at € 649 (approx Rs 52,500) or £ 579. Price & Color Priced: 6GB+128GB available at € 569 (approx Rs 46,000) and 8GB+256GB available at € 649 (approx Rs 52,500). Color: Saphire Blue, Phantom Blue, Phantom Red, Midnight Black.